Available in DVD with 31 Chapters! 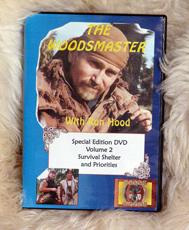 Volume 2 covers survival priorities, shelter techniques (location, construction), the Firebed, Heat loss mechanisms, insulating techniques, natural phenomena related to shelter and a bunch of special Woodsmaster© wilderness tricks. It includes "Fist time" estimation and height and distance estimation, including "The Rule of Thumb" and "Flip over Stick". Also included are special tricks for utilizing trash found in the wilderness.